I’ve been in Virginia the past couple weeks visiting family. I am loving it!! My twenty-two month old grandson is so adorable I can hardly stand it 😉 You can see some of the photos and videos on my facebook page. My daughter-in-law has made some amazing dinners and wine pairings with Passaggio Wines. The other day she decided to stop and get some wine at the store and asked what wine to get. I left it totally up to her. (I did give her a suggestion though – a CA Sauv Blanc 😉 – market research!!!) She brought several bottles home. 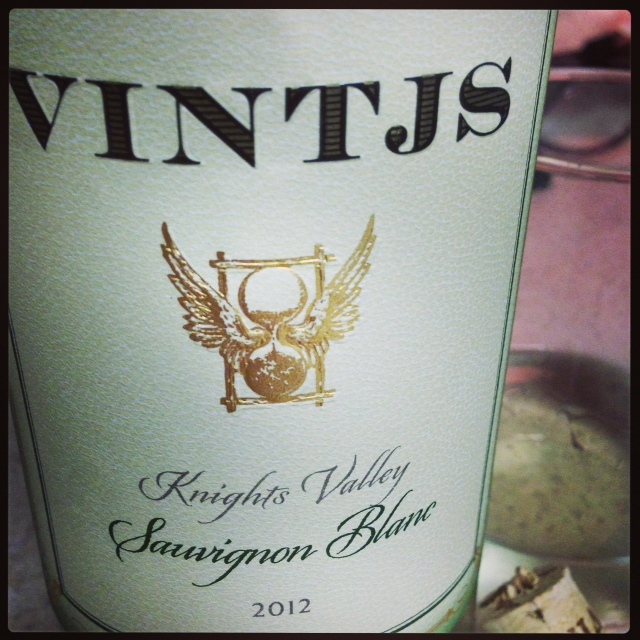 One was the VINTJS Knights Valley 2012 Sauv Blanc. I believe she paid about $7.99 at Trader Joe’s. Alc 14.6%. It’s made for TJS (Trader Joe’s), so maybe you can find out the source from their wine person via social media?